We have identified new activating receptors of the Ig superfamily expressed on human myeloid cells, called TREM (triggering receptor expressed on myeloid cells). TREM-1 is selectively expressed on blood neutrophils and a subset of monocytes and is up-regulated by bacterial LPS. Engagement of TREM-1 triggers secretion of IL-8, monocyte chemotactic protein-1, and TNF-α and induces neutrophil degranulation. Intracellularly, TREM-1 induces Ca2+ mobilization and tyrosine phosphorylation of extracellular signal-related kinase 1 (ERK1), ERK2 and phospholipase C-γ. To mediate activation, TREM-1 associates with the transmembrane adapter molecule DAP12. Thus, TREM-1 mediates activation of neutrophil and monocytes, and may have a predominant role in inflammatory responses. Neutrophil- and monocyte/macrophages-mediated inflammatory responses can be stimulated through many receptors with different structures and specificities (1). These include G protein-linked seven-transmembrane domain receptors specific for either fMLP, lipid mediators, complement factors, or chemokines, the Fc and complement receptors, the CD14 and Toll-like receptors for LPS, as well as the cytokine receptors for IFN-γ and TNF-α (2). In addition, engagement of these receptors can up-regulate or “prime” the responsiveness of myeloid cells to other stimuli, potentiating the inflammatory response (3). Neutrophils and macrophages express additional activating receptors, but their role in inflammation is unknown. These receptors belong either to the Ig superfamily (Ig-SF),3 such as Ig-like transcripts (ILT)/leukocyte Ig-like receptors (LIR)/monocyte/macrophage Ig-like receptors (MIRs), paired Ig-like receptor (PIR-As), and signal regulatory protein β1 (SIRPβ1), or to the C-type lectin superfamily, such as myeloid DAP12-associating lectin-1 (MDL-1) (4, 5, 6, 7, 8). Typically, all of these receptors bear some homology with activating NK cell receptors (9). In particular, they contain a short intracellular domain that lacks docking motifs for signaling mediators and a transmembrane domain with a positively charged amino acid residue. This residue allows pairing with transmembrane adapter proteins, which contain a negatively charged amino acid in the transmembrane domain and a cytoplasmic immunoreceptor tyrosine-based activation motif (ITAM). Specifically, ILT/LIR/MIR and PIRs are coupled with the γ-chain of the Fc receptors (FcRγ) (4, 5, 6), whereas SIRPβ1 and MDL-1 pair with DAP12 (7, 8). Upon ITAM phosphorylation, these adapters recruit protein tyrosine kinases, which initiate a cascade of phosphorylation events that ultimately lead to cell activation. The recent discovery of a new DAP12-associated receptor on NK cells, called NKp44 (10), suggested the possible existence of yet unknown DAP12-associated receptors also on other cells involved in innate responses. By screening a cDNA sequence database with the NKp44 polypeptide, we have identified new Ig-SF receptors exclusively expressed on myeloid cells, that were designated TREM (triggering receptor expressed on myeloid cells). Here we show that one of these receptors, TREM-1, stimulates neutrophil and monocyte-mediated inflammatory responses. GenBank expressed sequence tagged database (dbEST) was searched with the amino acid sequences of NKp44 using the tblastn algorithm. A contig assembled from 17 distinct cDNAs (accession nos. D78812, AI337247, AW139572, AW274906, AW139573, AI394041, AI621023, AI186456, AI968134, AI394092, AI681036, AI962750, AA494171, AA099288, AW139363, AW135801, AA101983) contained an open reading frame encoding TREM-1. Search of the dbEST with the complete TREM-1 open reading frame matched to one related sequence referred to as TREM-2 (accession no. N41388). The ∼760-bp TREM-1 and ∼1000-bp TREM-2 cDNAs were amplified by RT-PCR, cloned into pCR2.1 (Invitrogen, Carlsbad, CA), and sequenced. 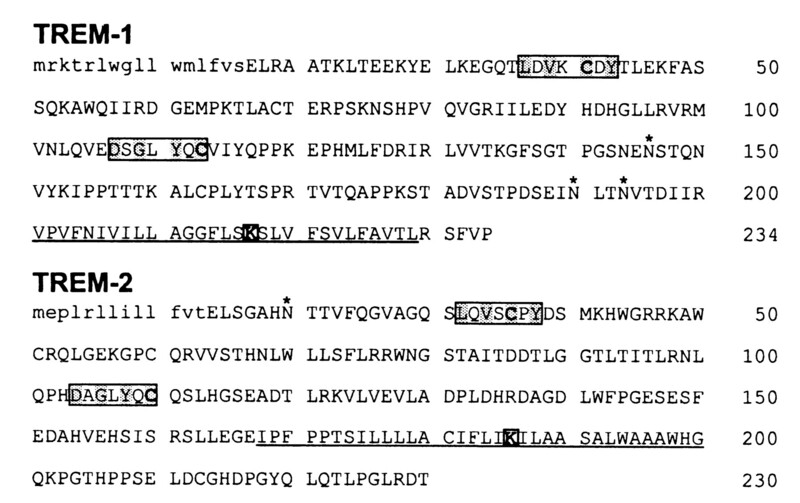 PCR primers were: TREM-1, 5′-GCTGGTGCACAGGAAGGATG, 3′-GGCTGGAAGTCAGAGGACATT; and TREM-2, 5′-TGATCCTCTCTTTTCTGCAG, 3′-GTGTTTAAAATGTCCAATATT. Human blood was mixed with one volume of 3% Dextran T-500 (Pharmacia, Uppsala, Sweden) in 0.9% NaCl to sediment erythrocytes. Leukocytes in the supernatant were further separated by gradient density centrifugation on Lymphocyte Separation Medium (ICN Biomedicals/Cappel, Aurora, OH) into PBMCs and neutrophils. CD14+ monocytes were purified from PBMCs by magnetic cell sorting using CD14 MicroBeads (Miltenyi, Bergisch Gladbach, Germany). To produce soluble TREM-1-Fc, the cDNA fragment encoding the TREM-1 extracellular region was amplified by PCR and cloned into an expression vector containing the exons for hinge, CH2, and CH3 region of human IgG1. Transfection of the chimeric gene into the mouse myeloma cell line J558L, screening of culture supernatants, and purification of TREM-1-Fc were performed as previously described (11). Anti-TREM-1 mAbs were produced by immunizing BALB/c mice with TREM-1-Fc as reported elsewhere (12). TREM-1 and TREM-2 were subcloned into pCMV-1-FLAG (Kodak) and expressed as amino-terminal FLAG peptide fusion proteins in COS-7 cells. DAP12 was subcloned into pHM6 (Boehringer Mannheim, Mannheim, Germany) and expressed as amino-terminal hemagglutinin (HA) peptide fusion protein in COS-7 cells. Transient transfections were performed as previously described (4). Cell surface expression of transfected cDNAs was determined by FACS analysis with anti-FLAG (Kodak), anti-HA (Boehringer Mannheim), and 21C7 mAbs. Before staining, all cells were incubated with PBS/20% human serum for 1 h on ice to block Fc receptors. Whole blood leukocytes were incubated with mAbs 21C7 (anti-TREM-1, IgG1), 3C10 (anti-CD14, IgG2b), and L243 (anti-HLA-DR, IgG2a) followed by isotype-specific FITC/PE/biotin-conjugated secondary Abs. After a further incubation step with APC-labeled streptavidin, cells were analyzed by FACS. Monocytes and neutrophils stimulated with LPS (1 μg/ml) for 16 h were stained with either mAb 21C7 or mAb 1B7.11 (control IgG1, anti-2,4,6-trinitrophenyl (TNP); American Type Culture Collection, Manassas, VA), followed by human-adsorbed PE-conjugated goat anti-mouse IgG. Purified monocytes or neutrophils were stimulated for 24 h in 96-well flat-bottom plates coated with F(ab′)2 goat anti-mouse IgG (5 μg/ml) followed by either 21C7, 1F11 (anti-MHC class I), or 1B7.11 (anti-TNP) mAbs. Cells were plated at a concentration of 5 × 104 cells/well in the presence or absence of LPS (1 μg/ml). Supernatants were collected and tested for production of IL-6, IL-8, IL-10, IL-12p75, monocyte chemoattractant protein-1 (MCP-1), TNF-α, and myeloperoxidase (MPO) by ELISA (PharMingen, San Diego, CA). To measure the expression of cell surface markers, monocytes and neutrophils were stimulated as described above and, after 48h, were stained with PE- or FITC-conjugated anti-CD11b, anti-CD11c, anti-CD18, anti-CD29, anti-CD32, anti-CD40, anti-CD49d, anti-CD49e, anti-CD54, anti-CD80, anti-CD83, or anti-CD86, (all from Immunotech, Marseille, France) and analyzed by FACS. Determination of intracellular Ca2+ mobilization was done according to previous reports (4). Determination of protein tyrosine phosphorylation, mitogen activated protein kinase activation, phospholipase C-γ (PLC-γ) phosphorylation, and immunoprecipitations were performed as previously described (7). The GenBank EST data base was searched with NKp44 polypeptide, and several overlapping cDNAs were found. These were assembled in a contig which contained an open reading frame en-coding a protein of 234 aa with a predicted molecular mass of ∼26 kDa (Fig. 1⇓, upper panel). The amino acid sequence begins with a hydrophobic signal peptide followed by an extracellular region composed of a single Ig-SF domain containing three potential N-glycosylation sites. The length of the Ig-type fold and the characteristic pattern Asp-Xaa-Gly-Xaa-Tyr-Xaa-Cys in the region leading to the β-strand F indicate that the Ig-type fold is of the V-type. The putative transmembrane domain contains a charged lysine residue and is followed by a cytoplasmic tail of 5 aa with no signaling motifs. Similar transmembrane and cytoplasmic domains are present in activating NK cell receptors which pair with the transmembrane adapter protein DAP12 (9). A cDNA containing the entire open reading frame was amplified by RT-PCR from monocytes and neutrophils, but not from lymphocytes or other cell types (data not shown). Therefore, we designated this molecule TREM-1. The GenBank EST database was then searched with TREM-1 polypeptide, and a novel cDNA encoding a TREM-1-homologue was identified. We designated this molecule TREM-2 (Fig. 1⇓, lower panel). The alignment of TREM-1, TREM-2, and NKp44 extracellular domains revealed ∼20% identity (data not shown). Analysis of somatic cell hybrids containing different human chromosomes demonstrated that the genes encoding TREMs maps on human chromosome 6, like the NKp44 gene (data not shown). Predicted amino acid sequences of TREM-1 and TREM-2. The signal peptide is indicated in lower-case letters. The potential N-glycosylation sites are indicated by asterisks. The cysteines potentially involved in generating the intrachain disulfide bridge of the Ig-SF V-type fold are marked in bold and are shown in the context of their flanking consensus sequences (highlighted in gray). The predicted transmembrane domain is underlined, and the charged lysine residue is boxed. TREM-1 and TREM-2 sequences have been submitted to GenBank database under accession nos. AF196329 and AF213457, respectively. To investigate the cellular distribution of TREM-1, we produced the anti-TREM-1 mAb 21C7. As shown in Fig. 2⇓A, mAb 21C7 stained TREM-1-transfected COS-7 cells, as compared with control transfectants. In addition, expression of TREM-1 was partially increased by cotransfection of DAP12 cDNA, suggesting that cell surface expression of TREM-1 may require association with either DAP12 or a related signaling molecule. In peripheral blood of different donors, 21C7 stained neutrophils and, to a lower extent, CD14high monocytes. 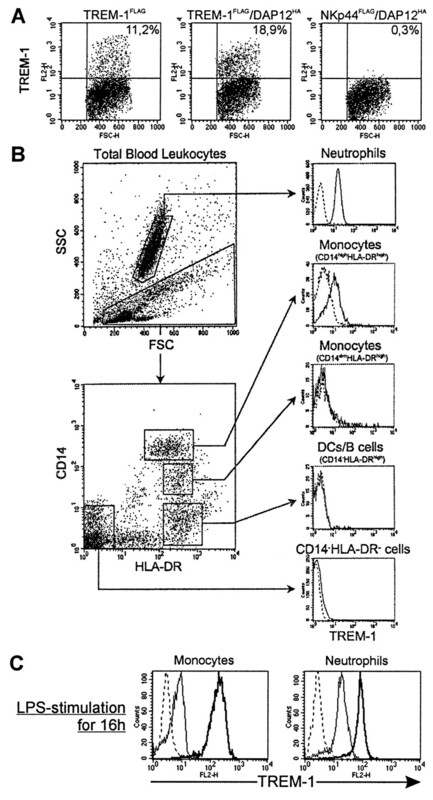 CD14dim monocytes, dendritic cells (DCs) or lymphocytes were TREM-1 negative (Fig. 2⇓B). We further investigated the expression of TREM-1 during differentiation of CD14+ monocytes into either DCs or macrophages in the presence of GM-CSF/IL-4 or M-CSF, respectively. TREM-1 was completely down-regulated on these cells after 3 days of culture (data not shown). Stimulation of DCs with LPS, heat-inactivated Gram-positive bacteria, Gram-negative bacteria, or fungi did not induce TREM-1 expression (data not shown). In striking contrast, these stimuli induced strong up-regulation of TREM-1 on neutrophils and monocytes (Fig. 2⇓C and data not shown). This selective expression of TREM-1 on neutrophils and monocytes and its induction by pathogens suggested that it may play a role in acute inflammatory responses. TREM-1 is selectively expressed on neutrophils and CD14high monocytes and is strongly up-regulated after LPS-stimulation. 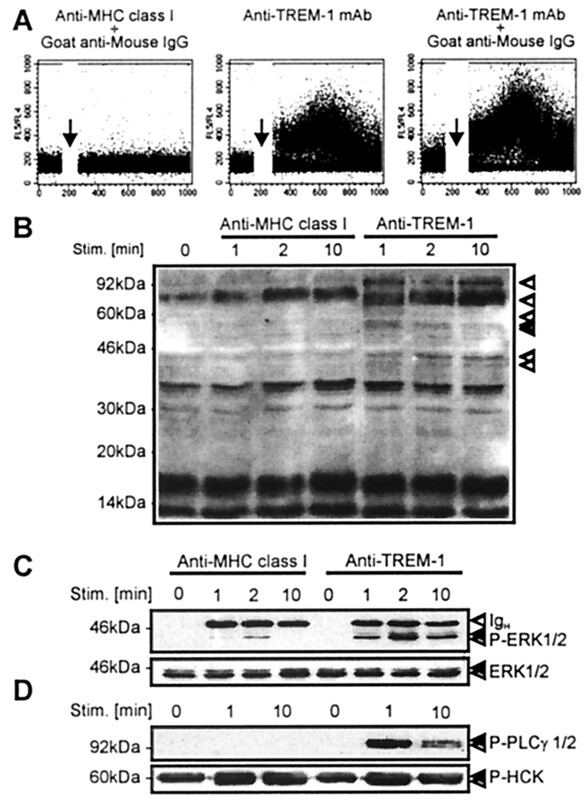 A, mAb 21C7 recognizes selectively TREM-1. FLAG-tagged TREM-1 (TREM-1FLAG) was expressed in COS-7 cells without (left panel) or with HA-tagged DAP12 (DAP12HA) (middle panel). Cells were analyzed by FACS with mAb 21C7, as compared with NKp44FLAG/DAP12HA cotransfected cells (right panel). The percentage of TREM-1-positive cells (upper right quadrant) is indicated. Expression of TREM-1FLAG, NKp44FLAG, and DAP12HA was confirmed using anti-FLAG and anti-HA mAbs (data not shown). Cells stained with a control Ab were contained within the lower right quadrant. B, Three-color FACS analysis of whole blood leukocytes. High side scatter cells correspond to TREM-1+ neutrophils. Low side scatter cells include CD14high/HLA-DR+ cells (monocytes), CD14dim/HLA-DR+ (monocytes), CD14−/HLA-DR+ cells (which include B cells and DCs), and CD14−/HLA-DR− cells (mostly lymphocytes). C, TREM-1 is strongly up-regulated after priming with LPS. LPS-treated (solid bold) or untreated (solid) monocytes, and neutrophils were analyzed by FACS for cell surface expression of TREM-1. Dashed profiles indicate background staining with a control IgG1 mAb. To examine whether TREM-1 can trigger acute inflammatory responses, neutrophils and monocytes were plated on a plastic surface coated with F(ab′)2 goat anti-mouse IgG and the mAb 21C7 and tested for secretion of chemokines and cytokines and for release of granule components. In neutrophils, cross-linking of TREM-1 induced secretion of IL-8 and release of MPO (Fig. 3⇓, A and B). This latter release was strongly potentiated following priming of neutrophils with LPS (Fig. 3⇓C). In monocytes, cross-linking of TREM-1 generated release of large amounts of IL-8 as well as MCP-1 and TNF-α (Fig. 3⇓, D–F). TNF-α and MCP-1 secretion was strongly up-regulated by LPS-mediated priming (Fig. 3⇓, G–H), further demonstrating the importance of bacterial costimuli for TREM-1-mediated activation. In control experiments, neutrophils and monocytes were stimulated with isotype-matched Abs which either bind (such as anti-MHC class I mAbs) or do not bind (such as an anti-TNP mAb) cells. In both cases, secretion of cytokines, chemokines, and MPO was 5- to 50-fold lower than that induced via TREM-1 (Fig. 3⇓ and data not shown). Thus, activation of neutrophils and monocytes triggered by anti-TREM-1 mAb is not due to engagement of Fc receptors. Secretion of cytokines important for the adaptive immune response, such as IL-6, IL-10, IL-12, or for surveillance against viral infections, such as type I IFN, were not significantly increased by engagement of TREM-1 (data not shown). TREM-1-mediated cytokine production and degranulation. TREM-1 triggers release of IL-8 (A) and MPO (B) in neutrophils and secretion of MCP-1 (D), IL-8 (E), and TNF-α (F) in monocytes. Monocytes or neutrophils were stimulated for 24 h with either anti-TREM-1 or control IgG1 mAbs (anti-MHC class I mAb) coated on plastic, and supernatants were analyzed by ELISA. Priming with LPS potentiates TREM-1-mediated degranulation of neutrophils (C) and secretion of TNF-α (G) and MCP-1 (H) by monocytes. Monocytes or neutrophils were left untreated or were challenged with LPS 1 h before stimulation with either anti-TREM-1 or control IgG1 mAbs coated on plastic. Supernatants were harvested after 24 h and analyzed by ELISA. As a control for degranulation, MPO release after stimulation with PMA is shown. All data points correspond to the mean and the SD of four independent experiments. The rapid migration of neutrophils and monocytes from the blood to the inflammatory site requires adhesion to endothelium and extracellular matrix proteins (14). Therefore, we tested whether engagement of TREM-1 stimulated up-regulation of adhesion molecules. As shown in Table I⇓, cell surface expression of CD29, CD11c, and CD49e, and to a lesser extent CD11b, CD49d, and CD18 were increased on both neutrophils and monocytes. Thus, TREM-1 may increase cellular adhesion to fibronectin, fibrinogen, and VCAM by up-regulating CD11b/CD18 (Mac-1), CD29/CD49d, and CD29/CD49e heterodimers, respectively. In addition, TREM-1 stimulation led to a strong up-regulation of the costimulatory molecules CD40, CD86 (B7.2), and CD54 (ICAM-1), as well as of CD83 and CD32 (FcRII) on monocytes. Thus, TREM-1 is not only capable of increasing adhesion of myeloid cells to endothelium and extracellular matrix molecules but can also prepare monocytes for costimulation of other cells recruited to the inflammatory lesions. Activation of neutrophils and monocytes is often accompanied by a number of intracellular changes. Indeed, ligation of TREM-1 with the mAb 21C7 elicited a rapid rise in intracellular Ca2+ concentration (Fig. 4⇓A). In addition, cross-linking of TREM-1 stimulated tyrosine phosphorylation of several proteins with apparent molecular masses of ∼40, ∼60, ∼70, and ∼100 kDa (Fig. 4⇓B). The observed ∼40-kDa tyrosine phosphorylated proteins correspond to mitogen activated protein kinases, as demonstrated by anti-phospho-ERK1/2 immunoblotting (Fig. 4⇓C). Precipitation of tyrosine phosphorylated proteins and immunoblotting with an anti-PLC-γ Ab, revealed that the observed ∼100-kDa phosphoprotein corresponds to PLC-γ (Fig. 4⇓D), thus explaining the observed Ca2+ influx. TREM-1 triggers intracellular Ca2+ mobilization and tyrosine phosphorylation of ERK1, ERK2, and PLC-γ. A, Anti-TREM-1 mAb induces intracellular Ca2+ mobilization in monocytes as compared with a control IgG1 mAb (anti-MHC class I). Ca2+ mobilization occurred even in the absence of a cross-linking Ab. Addition of Abs is indicated by an arrow. B, Anti-phosphotyrosine blot of cell lysates from monocytes stimulated with anti-TREM-1 or control IgG1 mAbs in the presence of a cross-linking Ab for the indicated time periods. C, Monocytes were stimulated as indicated in B and examined by Western blot analysis using anti-phospho-ERK1/2 (upper panel) and anti-ERK1/2 (lower panel) mAbs. D, Tyrosine phosphorylated proteins were precipitated from monocytes stimulated as indicated in B and immunoblotted with anti-PLC-γ (upper panel) or anti-Hck (lower panel) Abs. Anti-Hck blotting was performed as a loading control because phosphorylation of Hck is similar in both stimulated and unstimulated monocytes. Phosphorylated proteins are indicated by arrows in all panels. Molecular weight markers are shown. Biochemical analysis of TREM-1 immunoprecipitated from surface-biotinylated monocytes revealed that TREM-1 is a glycoprotein of ∼30 kDa, which is reduced to 26 kDa after N-deglycosylation, in agreement with the predicted molecular mass of TREM-1 (Fig. 5⇓A). Because TREM-1 lacks known signaling motifs in the cytoplasmic domain, it should associate with a separate signal transduction subunit to mediate activating signals. Adapter molecules, such as DAP12, are tyrosine phosphorylated upon cell treatment with the phosphatase-inhibitor pervanadate (9). 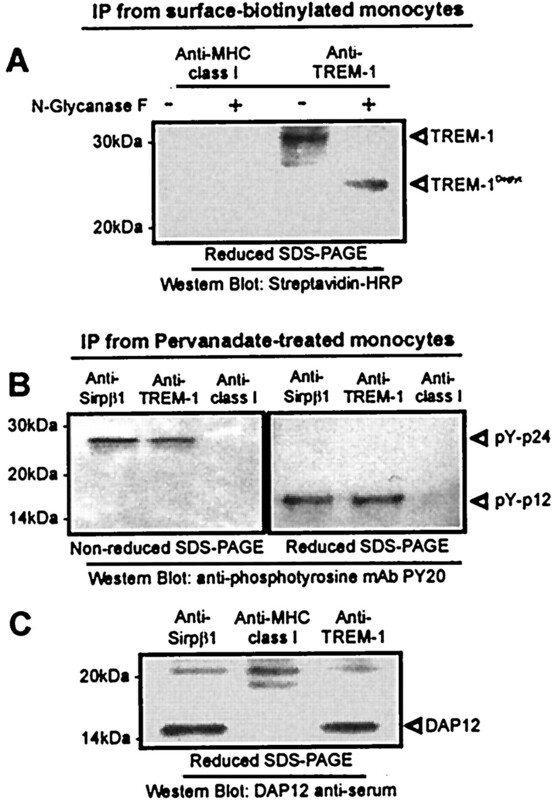 Indeed, anti-phosphotyrosine blotting of TREM-1 immunoprecipitates from pervanadate-stimulated monocytes revealed a phosphorylated protein of ∼12 kDa and ∼24 kDa under reducing and nonreducing conditions, respectively (Fig. 5⇓B). An identical pattern was observed after immunoprecipitation of SIRPβ1, which is associated with DAP12 (7). Indeed, immunoblotting of TREM-1 immunoprecipitates with anti-DAP12 demonstrated that TREM-1 associates with DAP12 (Fig. 5⇓C). TREM-1 is an ∼30-kDa glycoprotein associated with the adaptor protein DAP12. A, Anti-TREM-1 mAb or control IgG1 (anti-MHC class I mAb) immunoprecipitates from surface biotinylated monocytes were left untreated or treated with N-glycanase F, and analyzed by Western blot analysis with Streptavidin-HRP. B, Pervanadate-treated monocytes were subjected to immunoprecipitation with anti-TREM-1 mAb, anti-SIRP mAb as a positive control, or control IgG1. The precipitates were analyzed by anti-phosphotyrosine blot under reducing and nonreducing conditions. C, Anti-DAP12 blot analysis of a TREM-1 immunoprecipitate from monocytes (reducing conditions). Control IgG1 (anti-MHC class I mAb) and anti-SIRP mAb immunoprecipitates were included as negative and positive control, respectively. TREM-1 and DAP12 are indicated by arrows. Molecular weight markers are shown. Our results show that TREM-1 is a novel Ig-SF cell surface molecule which activates neutrophils and monocytes through the transmembrane adapter protein DAP12. TREM-1 induces secretion of inflammatory chemokines and cytokines, release of MPO, and up-regulation of adhesion molecules involved in extravasation. Cellular distribution and functional properties of TREM-1 suggest that it may have a role in acute inflammations, which are characterized by an exudate of neutrophils and monocytes. TREM-1-mediated pro-inflammatory responses are potentiated by priming of neutrophils and monocytes with LPS. Moreover, LPS, bacteria, and fungi up-regulate TREM-1 expression. Thus, TREM-1 and bacterial products induce inflammatory responses via intersecting and mutually stimulating pathways. To further define the relative contribution of TREM-1 to acute inflammation it will be important to define its ligand(s). In addition to TREM-1, we have cloned a novel cDNA encoding a TREM-1-homologue, called TREM-2 (Fig. 1⇑). Because TREM-2 is expressed on macrophages and DCs but not on granulocytes or monocytes (data not shown), it may have a role in chronic inflammations and may stimulate production of constitutive rather than inflammatory chemokines and cytokines. Thus, distinct TREM receptors may regulate acute and chronic inflammatory responses, allowing myeloid cells to mount distinct types of responses to different Ags. Both TREM-1 and TREM-2 display some sequence homology with activating NK cell receptors, such as NKp44 (10). All of these molecules display a single V-type Ig-like extracellular domain and associate with DAP12 to induce activation. In addition, they are encoded by genes on human chromosome 6. Thus, this chromosome may contain a gene cluster encoding structurally related receptors that activate cell types involved in different innate responses. We thank Jacqueline Samaridis and Lena Angman for excellent technical assistance; Susan Gilfillan, Paul Kinkade, Manfred Kopf, and Antonio Lanzavecchia for reviewing the manuscript; Kerry S. Campbell for anti-DAP12 Ab; and Miguel Lopez-Botet for anti-MHC class I Ab. ↵1 The Basel Institute for Immunology was founded and is supported by Hoffmann-La Roche Ltd, CH-4002 Basel. J.D. is a recipient of a postdoctoral fellowship from the Danish Medical Research Council. ↵3 Abbreviations used in this paper: Ig-SF, Ig superfamily; SIRPβ1, signal regulatory protein β1; TREM, triggering receptor expressed on myeloid cells; HA, hemagglutinin; TNP, 2,4,6-trinitrophenyl; MCP, monocyte chemoattractant protein; PLC-γ, phospholipase C-γ; DC, dendritic cell; MPO, myeloperoxidase; ITAM, immunoreceptor tyrosine-based activation motif; ERK, extracellular signal-related kinase. Rosenberg, H. F., and J. I. Gallin. 1999. Inflammation. In Fundamental Immunology, 4th Ed. W. E. Paul, ed. Lippincott-Raven, Philadelphia. p. 1051. Barclay, N. A., M. H. Brown, A. S. K. Law, A. J. McKnight, M. G. Tomlinson, A. P. van der Merwe. 1997. The Leukocyte Antigen Facts Book 2nd Ed. Academic Press, London.